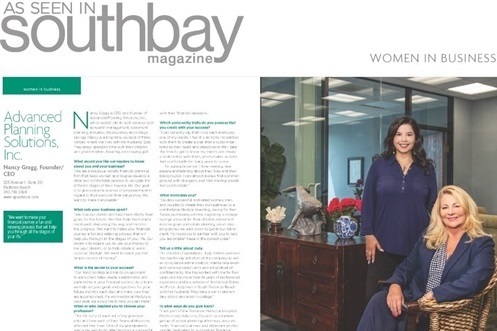 Nancy Gragg and Advanced Planning Solutions, Inc. as seen in South Bay Magazine | Advanced Planning Solutions, Inc.
We were recently featured in South Bay Magazine! We wanted to thank all our wonderful clients for making our business such a success. Here's a clip from the article and the rest of the interview can be viewed by clicking the link below. “We love our clients and help them clarify their goals for the future. We then help them implement each step along the way and monitor the progress. We want to make your financial journey a fun and relaxing process..."